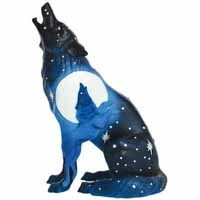 Wolf Eclipse | CowParade New Figurines | One Price Low Flat Shipping! From Westland Giftware's Call of the Wolf Collection, Wolf Eclipse. Made of hand-painted resin. Measures approximately 4" x 6"
This wolf is cast in a seated pose with a bright full moon painted on its side and a wolf depicted on its hind legs in the forefront. The wolf symbolizes free will, and as a pack wolves symbolize unity and strength. The wolf is held in high esteem in ancient traditions representing loyalty, intelligence, and courage, often being used as totems to represent tribes and ancestral clans.